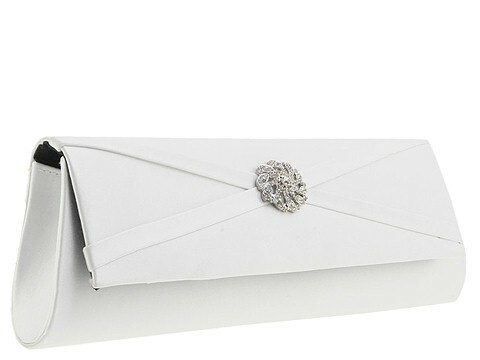 Add a subtly glamorous touch to your look with this beautiful clutch. Convertible clutch made of satin or synthetic leather. Please note: White satin is dyeable. Holds your credit cards, currency, lipstick and cell phone. Dimensions: 9.5 wide x 1.5 deep x 4 high. Single shoulder strap. Shoulder drop: 20 length. Elegant rhinestone-embellished ornament. Top flap with magnetic clasp closure. Interior lining with back wall slip pocket. Free shipping in the USA.